When you need a heavy duty solution and don't want to invest a fortune, the Channellock miter saw stand can be the perfect choice for you. This is a basic brand of miter saw stands that combine effectiveness and practicality for the woodworking professional. One of the first things you are going to notice about the Channellock miter saw stand is the fact that is has been designed to handle bigger projects. 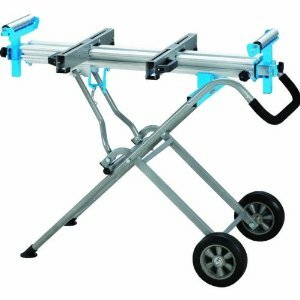 With sliding extensions and rollers, you are going to find that you can easily adjust the different sizes of tools that you are going to be able to use. The nice thing about the sliding extensions is the fact that they can go out as far as 12 feet. When you compare it to other saw stands on the market, you are going to find that this is considerably longer than many of the options available. What some might consider being one of the nice things about this miter saw stand is the fact that it remains a very lightweight solution. That means you will be able to pull it from one jobsite to the next, thanks to the aluminium construction. Best of all, you are going to find that it is also very durable and this is going to allow you to handle it without concern about it breaking under pressure when you need it to be there for you. In fact, many of the Channellock miter saw stands can handle up to 300 pounds, making them a good choice for any of the jobs you may have on the construction site. Those who have trouble setting up other miter saw stands may find that this choice is easier to use. Many people find that the setup can be used in just a few minutes and the release for the miter saw itself is designed for quick install and release that can all be done in no time at all. That makes this an exceptional choice for an individual that doesn't have a lot of time to waste as they mess around with their equipment. If you are in the market to pick up a new Channellock miter saw stand, then you will want to begin by looking at which styles and designs are going to work best for you, in terms of the projects that you are going to be working on. With so many exceptional choices out there, you will find that there is no end to the things you can do with the right tools. Remember, that even though these are considered basic models, they can still have the proven effectiveness of the major brands on the market. That means you have all the basic features that you need to get the job done, but without all the additional tools that can sometimes make getting the job done more difficult as you fight the portions that you will almost never use. Return From Channellock Miter Saw Stands Page to Home - Finishcarpentryhelp.com.